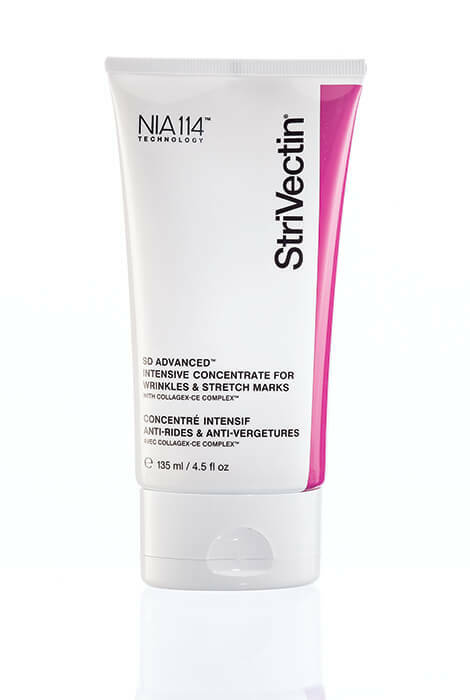 Strivectin® SD Advanced™ intensive concentrate is a stretch mark cream that significantly reduces the appearance of stretch marks and deep wrinkles in two to eight weeks! This powerful, peptide-packed StriVectin-SD™ formula is clinically proven to improve skin texture, even skin tone, and visibly fade stretch marks with twice-daily use. 4.5 fl. oz. Water (Aqua/Eau), Myristyl Nicotinate, Butyrospermum Parkii (Shea Butter), Butylene Glycol, Glycerin, Cyclopentasiloxane, Isocetyl Stearate, Isodecyl Neopentanoate, Peg-100 Stearate, Hydrogenated Vegetable Oil, Glyceryl Stearate, Dimethicone, Cetearyl Alcohol, Arachidyl Alcohol, Polyacrylamide, Behenyl Alcohol, Caprylyl Glycol, Phenoxyethanol, Panthenol, Stearyl Alcohol, C13-14 Isoparaffin, Arachidyl Glucoside, Mica, Dicetyl Phosphate, Ceteth-10 Phosphate, Benzyl Alcohol, Xanthan Gum, Laureth-7, Benzoic Acid, Sorbic Acid, Synthetic Wax, Tetrasodium Edta, Menthol, Chlorphenesin, Resveratrol, Ci 77891 (Titanium Dioxide), Aminomethyl Propanol, BHT, Urea, Sodium Pca, Ceramide 2, Malus Domestica Fruit Cell Culture Extract, Hydrolyzed Hyaluronic Acid, Polyquaternium-51, Trehalose, Hydroxyethyl Behenamidopropyl Dimonium Chloride, Cetyl Hydroxyethylcellulose, C20-40 Pareth-10, Rutin,Lecithin, CI 77491 (Iron Oxides), Polyquaternium-67, Triacetin,Sodium Hyaluronate, Ethylhexylglycerin, Tetrapeptide-21, Palmitoyl Oligopeptide, Palmitoyl Tetrapeptide-7, Phospholipids, Phaseolus Lunatus (Green Bean) Seed Extract, Lepidium Sativum (Sprout) Extract, Hexamethylindanopyran, Citrus Aurantium (Bergamot) Fruit Oil, Homolinalyl Acetate, Mentha Piperita (Peppermint) Oil, P-Menthanone, Dodecahydro-Tetramethylnaphthofuran, Salvia Sclarea Oil, Methyldihydrojasmonate. For wrinkles: Apply all-over to cleansed face in the AM and PM, gently massaging into wrinkle-prone areas. I am 72 and have been using this as a moisturizer almost exclusively for about 10 years. I am almost always taken for at least 10 years younger. I love it. It isn't greasy, makes y skin feel wonderful, and lasts a long, long time. I have used this product before and it very effective. Have used this product for years and like it and glad As We Change offers it. I believe this is a good product, it works!!!! I have used this product before, and had good results. I'm purchasing for chest wrinkles. Used it before. Could not find it any where. Saw it in your catalog. Love this product! !